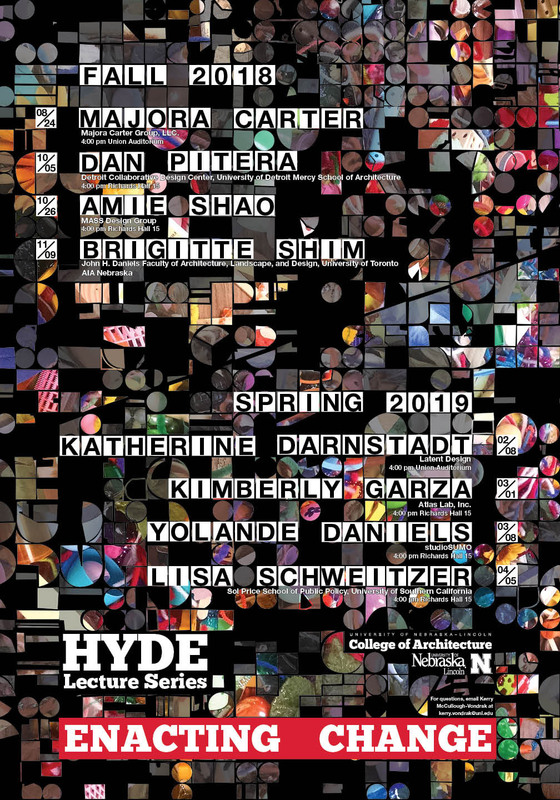 The College of Architecture is pleased to announce the Hyde Lecture Series opens another exciting chapter for the design and planning disciplines. The 2018/2019 series, “Enacting Change”, invites speakers to campus who utilize planning and design as tools for building agency in local and international communities. The college’s Hyde Lecture Series is a long-standing, endowed public program. Each year the college hosts compelling speakers in the fields of architecture, interior design, landscape architecture and planning that enrich the ongoing dialog around agendas which are paramount to the design disciplines and College of Architecture graduates. The college is also pleased to share this year’s Hyde Lecture Series poster was designed by Atlas Lab Inc.
Speaker: Majora Carter, CEO of Majora Carter Group, LLC. Date, Time & Location: October 5, Friday, 4:00 pm, Richards Hall, Room 15. Date, Time & Location: October 26, Friday, 4:00 pm, Richards Hall, Room 15. Date, Time & Location: November 9, Friday, 4:00 pm, TBA. Date, Time & Location: February 8, Friday, 4:00 pm, Union Auditorium. Date, Time & Location: March 1, Friday, 4:00 pm, Richards Hall, Room 15. Date, Time & Location: March 8, Friday, 4:00 pm, Richards Hall, Room 15. Date, Time & Location: April 5, Friday, 4:00 pm, Richards Hall, Room 15.